The 700+ hedge funds and money managers tracked by Insider Monkey have already compiled and submitted their 13F filings for the third quarter, which unveil their equity positions as of September 30. We went through these filings, fixed typos and other more significant errors and identified the changes in hedge fund positions. Our extensive review of these public filings is finally over, so this article is set to reveal the smart money sentiment towards Blackstone Mortgage Trust Inc (NYSE:BXMT) . Blackstone Mortgage Trust Inc (NYSE:BXMT) has experienced a decrease in activity from the world’s largest hedge funds in recent months. BXMT was in 17 hedge funds’ portfolios at the end of September. 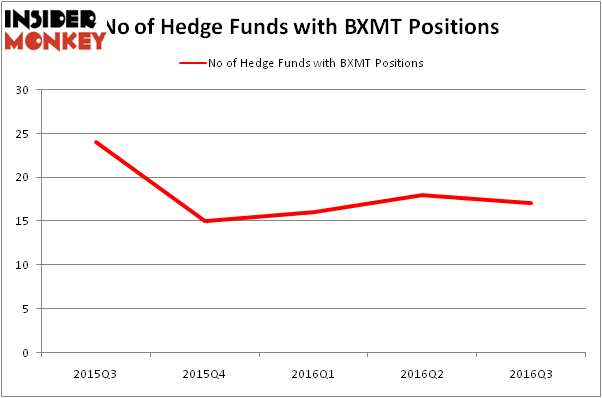 There were 18 hedge funds in our database with BXMT holdings at the end of the previous quarter. The level and the change in hedge fund popularity aren’t the only variables you need to analyze to decipher hedge funds’ perspectives. A stock may witness a boost in popularity but it may still be less popular than similarly priced stocks. That’s why at the end of this article we will examine companies such as Ciena Corporation (NASDAQ:CIEN), Paycom Software Inc (NYSE:PAYC), and InterXion Holding NV (NYSE:INXN) to gather more data points. At the end of the third quarter, a total of 17 of the hedge funds tracked by Insider Monkey were bullish on this stock, a 6% dip from the previous quarter. By comparison, 15 hedge funds held shares or bullish call options in BXMT heading into this year, though that came after a decline of 9 in Q4 2015. With hedge funds’ capital changing hands, there exists an “upper tier” of noteworthy hedge fund managers who were upping their holdings significantly (or already accumulated large positions). Of the funds tracked by Insider Monkey, John Khoury’s Long Pond Capital has the biggest position in Blackstone Mortgage Trust Inc (NYSE:BXMT), worth close to $166.8 million, accounting for 7.8% of its total 13F portfolio. The second most bullish fund manager is John Armitage of Egerton Capital Limited, with a $47.2 million position. Remaining peers that are bullish include Charles Clough’s Clough Capital Partners, Mark Kingdon’s Kingdon Capital, and John Overdeck and David Siegel’s Two Sigma Advisors. We should note that none of these hedge funds are among our list of the 100 best performing hedge funds which is based on the performance of their 13F long positions in non-microcap stocks.